In celebration of Women’s History Month and Feminists for Life’s 45th Anniversary, you will see our new Women Deserve Better® ad on both our website and Facebook page. Downloadable ads are available for posting. With unanimous bipartisan support, the Inspiring the Next Space Pioneers, Innovators, Researchers, and Explorers (INSPIRE) Women Act (H.R. 321), introduced by Congresswoman Barbara Comstock (R-Va.), and the Promoting Women in Entrepreneurship Act (H.R. 255), introduced by Congresswoman Elizabeth Esty (D-Conn.), became law. The two bipartisan bills encourage more women to pursue careers in science. This is an area that FFL has been advocating: education that leads to good jobs, and expanding opportunities for high-paying jobs. With so much news about pro-life feminism, we are offering FREE “Ride the Wave” kits for Women’s History Month for pro-life students to table. 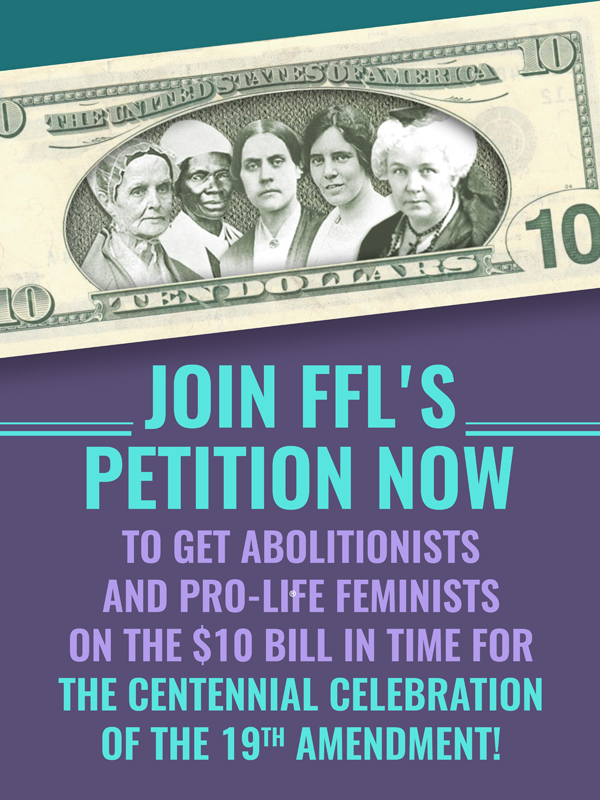 By asking other students to sign the petition and get our “Voices of Our Feminist Foremothers” brochures, this is a terrific opportunity for them to inform other students that the first wave feminists were pro-life, like us! The kit will contain lots of other tools for the pro-life group, too, like “First Wave Feminists” and “Pro-Woman Answers to Pro-Choice Questions™” magazines, and much more. Gifts of $45, $450, $4,500, or any amount are deeply appreciated as we work to fulfill the unrealized vision of Susan B. Anthony and other first wave feminists who refused to choose.